I actually read four books this week, but I find myself capable of only reviewing one. I reviewed one of the four–Get Out of My Life–last week here, and I can’t review two of them here due to my policy of not reviewing books here if I can’t given them more than three stars out of ten, so I sent constructive, private, and detailed information to their publishers via the channel from which I obtained them. 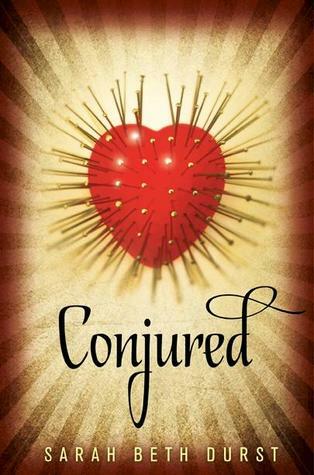 I’m excited to review the fourth book–Conjured by Sarah Beth Durst–because it provided a lot of material for both my imagination and analytical mind. It was truly a haunting, mind-bending read. 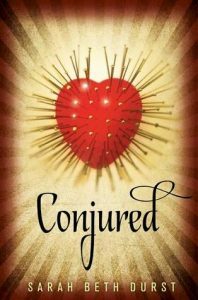 Conjured is the story of a girl named Eve who dreams of a tattered carnival tent, a machiavellian Magician, and a Storyteller who sews buttons into Eve’s skin. These dreams are the only clues she can provide about the serial killer who stalks her to the agents of the witness protection agency she’s protected by during the day. Those dreams cost her memories, so that she is constantly amnesic even as the agency pushes her to envision more clues to the identity of her stalker to prevent not only her death but the deaths of others. It is a plot that grips by virtue of its mystery, and Durst masterfully releases details in the form of dreams at just the right pace to keep the reader intrigued but not mystified. Like the bread crumbs of the Hansel and Gretel tale, they sate the reader just enough to read a few more pages until more are provided. Those detail “crumbs” lead to a climax that is as mind-bending and macabre as the ending of Hansel and Gretel. At the risk of spoiling the ending, remember that the boy and girl in that tale find themselves entrapped in a house made of candy and sweets, the very things they feel so deprived of. The hag who owns the house and entraps them desires to eat them, but they are eventually able to use that desire against her to defeat her by the same means she was going to use to eat them. By that same token, Eve, in pursuit of the memory she wants so badly to return, finds her way to the Magician, with a boy by her side, and becomes entrapped by him. If one reads this book with the idea in mind that this story is very much a modern re-telling of Hansel and Gretel, Conjured makes much more sense and seems much less…weird. If one takes it literally, as one is tempted to do by the narrative of Eve’s interactions with the agency (which is the first two-thirds of the book), one will be totally thrown off by the last third. But if the reader takes all of it literally–the narrative, the interactions, her dreams, all of it–one will take the ending in stride and remark at how they didn’t see the similarities between this book and the tale published more then two centuries ago until they’d finished it. They will also marvel, as did I, at the deftness with which Durst unravels such a twisted yet obvious plot; Eve’s story could not have ended in any other way than the way in which it did end, given the beginning. There’s nothing paranormal or science-fiction-like about this book. It’s about a female Jason Bourne, a woman who used to be a CIA agent but was inexplicably ousted and then put in perpetual mortal terror by her former employers. 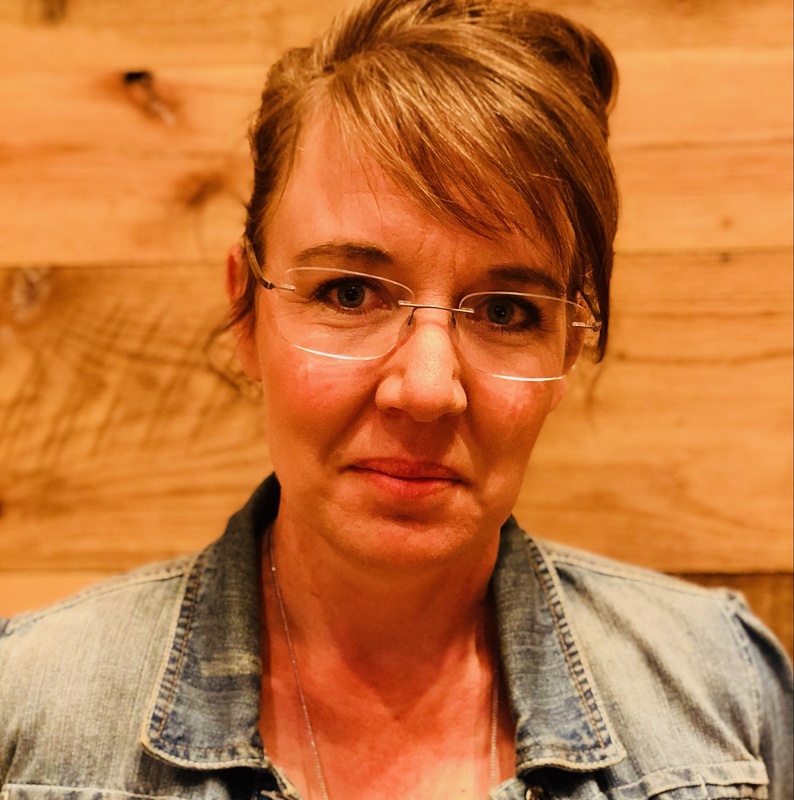 She was an agent who specialized in various forms of chemical torture, so she’s able to elude even the most persistent of government killers using those skills as her defense. In an unexpected move, her former boss reaches out to her with what she thinks is a way for her to at least end this reign of personal terror, if not redeem herself entirely, but that embroils her much more deeply than she ever thought possible not only in his treacherous moves but also in a chance for romance and a normal life with an unwitting accomplice. As a premise, it’s great. And as far as this description of it goes, it’s really good. 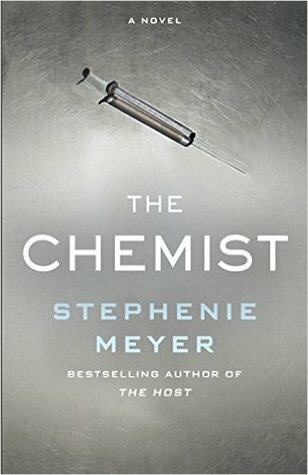 The first third or so of The Chemist is amazing as it delves into the mind of this lonely, brilliant, wanting-to-be-humane-but-trapped woman and her painstakingly careful efforts to stay alive. But a romance develops surprisingly easily between her and the man that her former boss told her to torture, and whom she did torture, and it kind of takes over the plot after that point and slows it down considerably as they go into hiding. The last third of the book is quite intense, intricate even, and full of action. It reveals Meyer’s skill with advancing plot by developing characters, something that is not easy to do. The survival of the main character, Alex, throughout that middle third of the book and even into the end is made possible by various ancillary characters whose motives for such involvement are never really disclosed and whose willingness to put themselves in harm’s way is doubtful. How many stars (out of 10) would I give it? Probably six. Would I recommend it to others? Yes, with the caveat that you either buy it used or in paperback, because you’ve got to spend $15 on a 500-page hardback otherwise.